Ronde Wedang Delicious Recipes .For lovers of culinary must have its own way of presenting and workmanship, for dish-dish like this they say is the menu of the most special or referred to the main menu, but not everyone or not all families are so very fond recipes drink this one, but if you dikeluarga is the culinary connoisseur seems to be very suitable to serve you in the family, in addition to the sensation that can provide a delicacy that can satisfy you. Already have you enjoying a dish of this one, if for you Recipes Delicious Wedang Ronde is the latest dish you've never tried, it would not hurt you to try the recipe now for this one. Contents, blender warm peanut, sesame, sugar, and salt until blended. Shape into small spheres. Set aside. 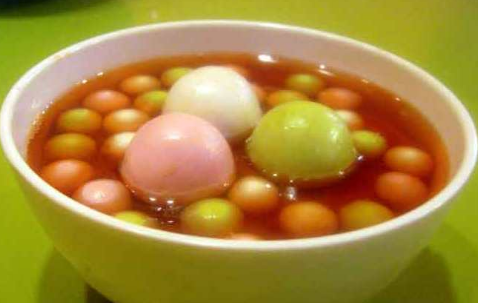 Ronde, mix glutinous rice flour and salt. Stir well. Add warm water a little while diuleni until smooth. Divide the dough into three parts. One section add red coloring and stir well. One section add green coloring and stir well. The rest leave it white. Take a bit of material round. Flatten. Give the contents. Round shape. Do it until the dough runs out. Boil water. Enter the sticky rice balls. Boil until the float. Remove and drain. Ginger syrup, boil the water, sugar, ginger, pandan leaves, and lemongrass over low heat until boiling and fragrant. Serve ginger syrup rounds together and complement. 0 Komentar Untuk "Ronde Wedang Delicious Recipes"